Taking Superstar Rajni and turning him into an animated action hero is certainly novel and Soundarya deserves praise for breaching the boundaries of Tamil cinema and attempting something as different as motion capture animation. With Deepika Padukone as the heroine and experienced actors such as Jackie Shroff and Nasser in supporting roles, the potential is certainly there for something amazing but despite all the innovation and obvious hard work, Kochadaiiyaan doesn’t quite deliver. K.S. Ravikumar’s story isn’t the problem. It’s a swashbuckling period adventure with enough substance to fill a couple of hours comfortably with a few credible twists in the tale. The dialogue also seems fine, even when subtitled, and the characters are reasonably convincing within the storyline. It’s more basic than that – the real issue here is that animation is just not as good as the real thing. The film tells the story of Rana (Rajinikanth), who left the kingdom of Kottaipatinam as a child and ended up as the army commander of rival nation Kalingpuri. A flashback in the second half explains Rana’s background as the son of legendary warrior Kochadaiiyaan (also Rajinikanth) who was himself betrayed by the King of Kottaipatinam. 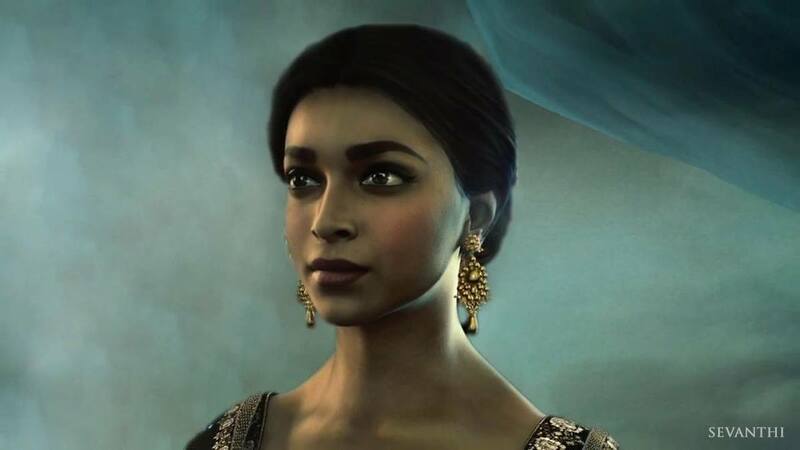 In between there are battles, betrayals, social justice as Rana frees slaves, and of course some romance with Princess Vadhana (Deepika Padukone). 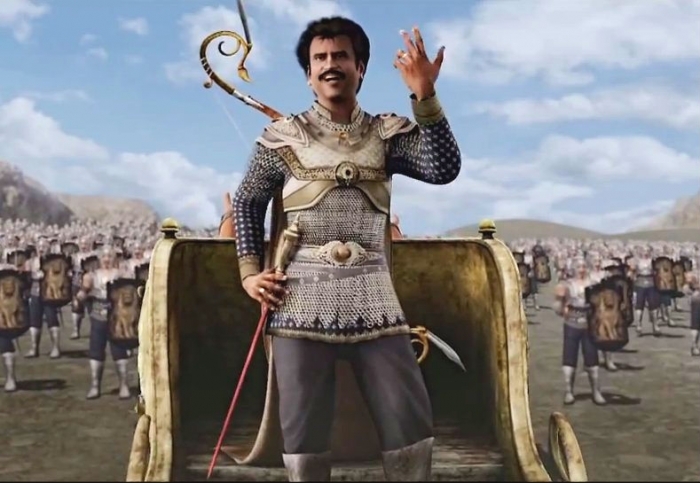 Rana is a rather more subdued character for Rajnikanth, despite his heroic looks and charismatic style with Princess Vadhana and the swash and buckling only really starts to take off when Kochadaiiyaan appears in the second half. Maybe it’s a case of getting more used to the style, but the film is livelier after the interval, and Kochadaiiyaan appears more splendidly heroic than his son. I have to admit I’m not a fan of this ‘almost life-like’ animation. I found Polar Express creepy and much prefer my motion capture as a dash of CGI in films such as Lord Of The Rings and Transformers, or as complete fantasy like Shrek and Despicable Me. While motion capture gives characters a relatively life-like appearance, it’s not real enough to be able to convey emotion convincingly and the lack of facial expression is disturbing, as nothing looks quite ‘right’. It’s hard to generate any empathy with the characters despite the attempts at laughter and tears, especially when some of the smiles look more like grimaces. It also doesn’t help that the animation here is variable, with some characters, such as the young Rana and his brother Sena appearing almost unfinished with strangely elongated limbs and disjointed necks, while the horses and elephants appear very clunky when in motion. Another casualty of the animation process is the dancing, which ends up appearing jerky and awkward much of the time. It also looks a little odd to have large numbers of dancers completely in sync in the background – rather than looking impressive it just looks strange and almost sinister. However, on the plus side, the costumes by Neeta Lulla are stunning with amazing attention to detail, which likely would not have been possible in real life. That also applies to most of the action scenes which just wouldn’t have been possible with real actors and animals. Peter Hein is credited as the action co-ordinator but his talent with co-ordinating fight scenes doesn’t translate well to animation. The scenery is generally spectacular though with plenty of grand palaces and surreal gardens, although there are a few times when the background just looks rather bland and unfinished. I hadn’t heard the film soundtrack before watching the film, but the music by A.R.Rahman, is one of the highlights and suits the rather grandiose and somewhat sweeping scale of the story. I would have preferred Kochadaiiyaan if the CGI had been limited to the background, enhancing the fight scenes and sprucing up the scenery, while the actors played their roles instead of using motion capture animations. Although the downside would be that quite a number of the scenes would have to be less extravagant, it could have made for a more engaging film. However, setting aside the animation issues I still did mostly enjoy the film, mainly due to the tale of Kochadaiiyaan and the music. The end of the film leaves a sequel likely and I hope that does happen, although the animation issues do need to be addressed in any follow-up film. Kochadaiiyaan is probably best watched by Rajinikanth fans but if you can cope with the animation it may be worth a watch, even if only to see the first complete motion capture Indian animation film. This entry was posted in Kollywood and tagged A.R. Rahman, Deepika Padukone, Jackie Shroff, K.S. Ravikumar, Kochadaiiyaan, Kochadaiyaan, Nasser, Neeta Lulla, Peter Hein, Rajinikanth, Rajni, Soundarya R. Ashwin, Soundarya Rajinikanth, Tamil. Bookmark the permalink.